Feel free to post threads in this subforum regarding any bugs or suggestions for this forum! 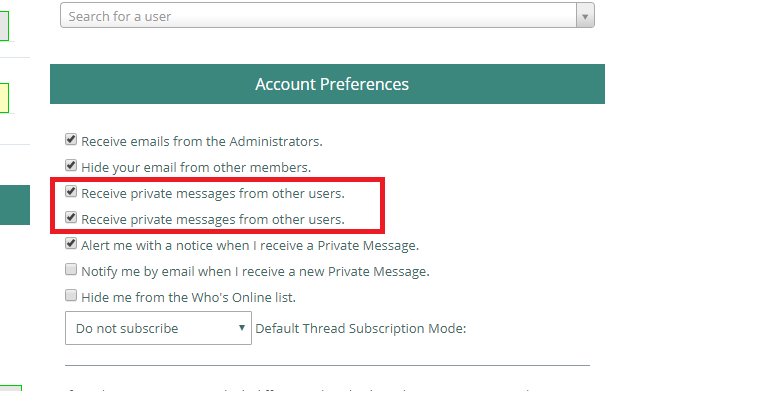 noticed this when I was signing up, "Receive private messages from other users" appears twice under account preferences. Thanks for letting us know; I'm sure now that list no longer be doubled. Pet is our awesome magical bug fixer, all hail Pet! How do you set your birthday? Is that something I missed during sign-up? (06-08-2018, 06:06 PM)AwesomeBlossom Wrote: How do you set your birthday? Is that something I missed during sign-up? whoops sorry I didn't see this, you can click the drop-down arrow in top-right corner and go to your CP, then click the blue gear button that will appear on the left side, and go down to Edit Profile option. There's a lot of spam posts on the forum. I've been trying to report them when I see them, but I don't know how much that is actually helping. (07-20-2018, 06:51 PM)AwesomeBlossom Wrote: There's a lot of spam posts on the forum. I've been trying to report them when I see them, but I don't know how much that is actually helping. Thanks for letting us know; now I have managed to purge them all. Maybe add a thread that only staff can post on where it has changelogs and release dates for past updates? I like it when I can see that information, it's interesting. I’ve tried reinstalling the app and logging out and back in, but nothing’s helped as of now. This seems like a pretty major bug, but I can’t find any other people it’s happened to!! Hopefully this is the right place to put this, and if anybody has the customer support email please let me know!